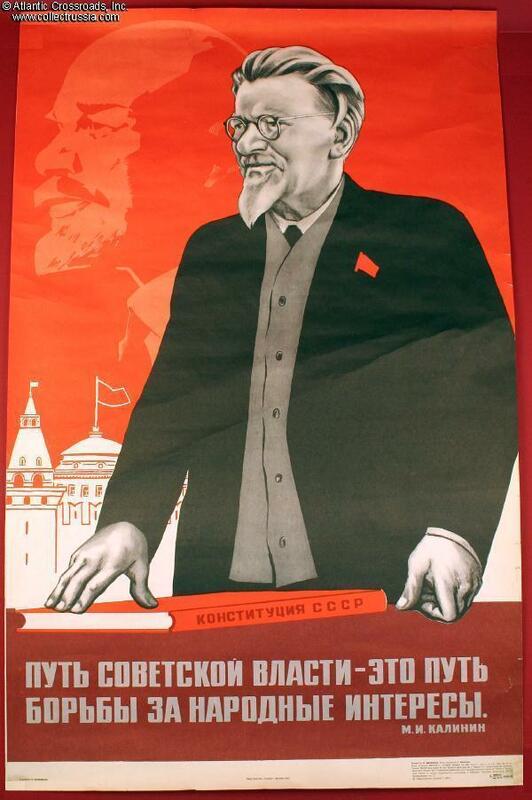 Celebration of the Constitution (Fundamental Law) of the Soviet Union features Mikhail Kalinin, titular head of the USSR from 1922 to 1946. 25 1/4" x 39 1/2". Quote indicates that the way to Soviet power is through the struggle for the people's interests. On paper, at least, he was the technically head of the Soviet government for twenty-seven years. By the 1970s and 80s, he was virtually the sole remaining civilian personality from "back in the day" in the USSR whom it was safe for artists to portray on a poster. While most of the places named for Soviet leaders have now reverted to their pre-1917 names, Kalinin still has a city named for him: Kaliningrad, the former Königsberg in what was once East Prussia.